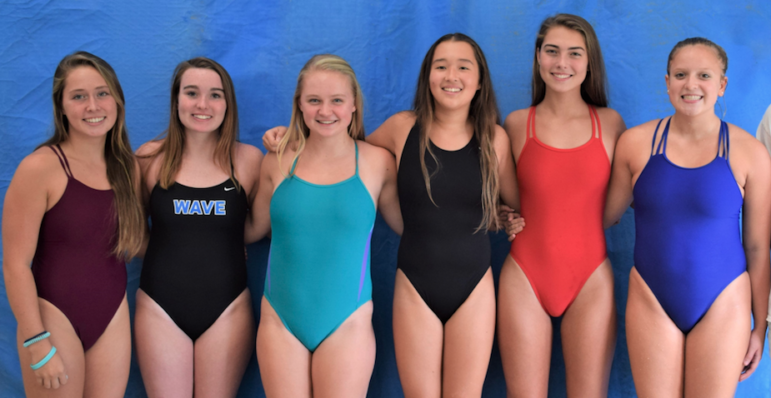 This week is “Rivalry Week” for Darien and New Canaan high schools, with five different match-ups between Darien and New Canaan high school, with matchups between varsity teams: diving, swimming, boys soccer, girls soccer and field hockey. In diving, the Battle of the Boards will take place on Tuesday, Oct. 9 as the six top divers (three per school) will compete for critical points. The Rams-Wave diving showdown also represents the first time that DHS Diving Coach Kyle O’Donnell will face off against his former diving coach, New Canaan’s Joe Somma, in competition. O’Donnell was coached by Somma when the DHS coach was a member of the Whirlwind Diving Team at the New Canaan YMCA. O’Donnell (DHS graduate and All-American diver) began his first season as DHS dive coach in August. Darien’s Blue Wave squad hopes to defeat the Rams and add to its perfect record of 5-0 (summary below). The competition takes place at New Canaan YMCA, at 564 South Ave., New Canaan. Diving warm-ups will begin at 2:30 p.m. and the competition will kick off at 3 p.m.